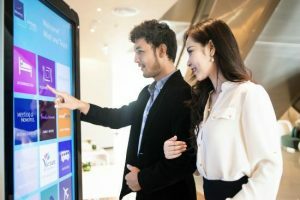 Utilising Interactive touch screens at your event will allow you to deliver engaging presentations and even allow your audience to participate, as they can literally interact with the data by selecting particular parts of an image or text. This also means that you are able to provide a personalised experience for the user, they will leave feeling more involved in the event. Allowing the audience to connect with the visual presentation is a method which will result in your company gaining instant feedback or collecting invaluable data, including live data feeds. The Iiyama touch screens are easy & quick to set up either as wall mounted or on a stand. They can also be changed into Interactive totems by replacing the standard mount with a custom branded stand typically 2m tall and 1m wide. This option is proving popular for events needing interactive signage. With technology changing constantly, audiences expect the latest products and software available. The technology in the screens is excellent for allowing the user to highlight specific information, send or receive data via email or downloads, annotate, draw images to show how you want something represented, erase any information easily, or just simply move and rotate images. Compatibility with combination of text, graphics, video footage, social media sites and web content means the possibilities for your presentations are endless. We have the 55”, 65” 4k 75” and 86″ touch screens available. The screens we supply use cutting edge technology, offering functions suited for different event types. The screens are lightweight and are powered by direct USB, resulting in a high energy efficient product. The touch screens provide the user with a realistic writing experience all the while delivering images in 4K, which offers rich colours and contrast with clear detail. 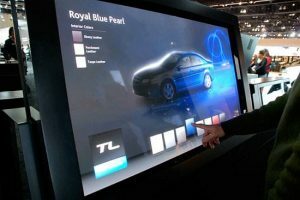 There are 10 multi touch-points which are accurate and have no dead spots across the entire screen. The response time of 8ms allows users to experience fast interactivity rate. When the user does touch the screen, it allows for 2mm max touch point accuracy. The screen has the added benefit of the anti-glare surface, which makes it ideal for use in bright sun-filled environments. The infrared technology means no wires, therefore a clean professional look.